A devastating and penetrating account of the abduction and subjection of a Northern free black man in the South during the decades before the Civil War. 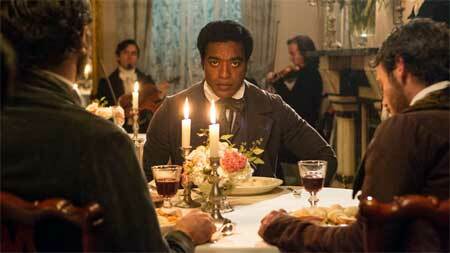 Solomon Northup (Chiwetel Ejiofor), a free black family man and a talented violinist living in upstate New York, is seduced into the possibility of business prospects by a couple of swindlers who arrange for his abduction to the South where he is sold into slavery and held for over a decade. This absolutely riveting film is one of the best film treatments of the African-American slave experience I have seen. It is also one of the most brutal. Despite that, the brutality never seems gratuitous but is so vividly integrated into the narrative that its presence is completely understandable. One walks away from the theatre in shock, but shocked with a visceral understanding and appreciation of the horrors of this deeply grim chapter of the American experience. The writing and direction of this film are consistently taut, clear and effective with results that are so heartbreakingly believable at points that it is hard to watch; yet, one cannot, by virtue of the compelling execution, take one’s eyes away. There is a scene in which Northup is forced by the warped and sadistic slaveowner Edwin Epps (Michael Fassbender) to whip another slave. The scene is played out with such unremitting narrative precision that its depiction of pure heartlessness, next to the mutual tragedy of victim and unwilling executioner, is virtuosic. Chiwetel Ejiofor gives a noble and penetrating account of Northup, ably conveying throughout the combination of helplessness and subliminal hopefulness wrapped in a vivid recognition of absurd injustice required by the role. Lupita Nyong’o (Patsey), the object of Epps’ affections and perversions, offers a deeply affecting portrayal of terror in the face of lunacy. The sheer pain she silently expresses through her hypnotic gaze is striking. Michael Fassbender (Edwin Epps) delivers a tour de force performance as the villain slave owner, painting a picture of a tyrant whose accepted form of insanity governs, with unpredictable terror, the lives of its many victims. Sarah Paulson (Mistress Epps) is chillingly effective as Epps’ wife, whose insecurity, jealousy and dour hauteur complement and support his lunacy. Brad Pitt (Bass), as the knight in shining armor, does a fine job of being saltily down to earth as well as heroic. Paul Dano (Tibeats), who made a funny, offbeat impression as the silent brother in Little Miss Sunshine (2006), is a formidable wretch here, convincing as a ragefully unbalanced overseer. Benedict Cumberbatch (Ford) gives a revealing portrait of a hapless slaveowner, kinder and gentler, but far weaker, than the horrifyingly unstable Epps. Noted actors like Paul Giamatti (Freeman) and Alfre Woodard (Mistress Shaw) have small but compelling roles. Superbly written, directed and acted, this is a film not to be missed. It is unsettling, terrifying and unforgettable.